We started out as a small used book store about 20 years ago. We occupied a small storefront with approx. 1000 square feet. We would find books wherever we could. Frequenting estate sales, garage sales, and auctions was a normal occurrence for us. Bringing our customers the best quality books for an even better price was our goal. We now occupy four storefronts with approx. 7000 square feet and stock well over 200,000 items. We process approx 150-400 used books each day through our trade credit program. New items hit the shelves each and every day! Through it all we still strive for the same goal. TO BRING YOU THE BEST QUALITY BOOKS FOR AN AFFORDABLE PRICE. 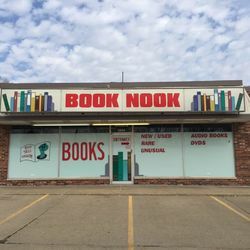 Terms of sale for The Book Nook 30 day return guarantee, with full refund including original shipping costs for up to 30 days after delivery if an item arrives misdescribed or damaged.